Canadian Country Music Hall of Famer Ronnie Prophet died on Friday (March 2) at his home in Florida after suffering kidney and cardiac failure. He was 80. 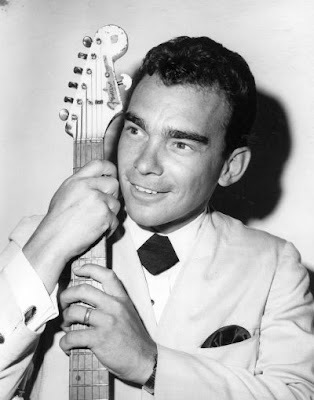 With a very heavy heart, but with so many fond memories, so very sad to hear the legendary Ronnie Prophet passed away this morning at the age of 80. The Canadian Country Music Hall of Fame member was probably the most gifted Canadian country music entertainer to every hit any stage. Chet Atkins once said Ronnie put on the greatest one-man show he had ever seen. My sincere and deepest condolences to Glory-Anne Prophet, the rest of his family, friends and fans. Godspeed, my friend, and thanks so much for the music, the laughs, the interviews and the lessons. There are no words to express the heartache of losing my best friend and the love of my life. Ronnie’s sense of humor has sustained me through the years no matter the circumstances even to the very last. Chet Atkins music was playing softly in the background till he left us for his heavenly home this morning at 8:40 He loved life, + friends, family + his fans were so important to him. His passion for music was part of who he was and it was always his wish to keep people smiling wherever he went. Thank you for all the kind and encouraging words. I will continue to read them and they will help my grieving heart of losing him but knowing that he was loved and will be missed by others. God bless you all. Prophet was born in Hawkesbury, Ontario and grew up in Calumet, Quebec. At the age of 15 he made his first media appearance on Ottawa's CFRA's The Happy Wanderers music program and, two years later, moved to Montreal where he started singing in local clubs and venues. In 1964, Prophet moved to Ft. Lauderdale, FL and, in 1969, settled in Nashville where he opened his own club, Ronnie Prophet's Carousel Club. Ronnie first charted in 1973 when his "San Diego" went to number 36 but it wasn't until three years later that he had his first big hit, "Shine On" (1976 / #13 Canadian Country). Over the years, he hit the top ten with "The Phantom of the Opry" (1979 / #3 Canadian Country), "The Ex-Superstar's Waltz" (1982 / #8 Canadian Country) and "No Holiday in L.A." (1987 / #9 Canadian Country). His biggest hit in the U.S. was "Sanctuary" (#26 Country / #20 Canadian Country). In the 80's, he scored two more major hits with duets with his wife, Gloria-Anne Carriere, "If This is Love" (1984 / #6 Canadian Country) and "I'm Glad We're Bad at Something" (1985 / #10 Canadian Country). Possibly more important in his career was his long list of television programs that featured both Canadian country artists and those from the U.S., including Country Roads (1973, CBC), The Ronnie Prophet Show (1974, CBC), Grand Old Country (1975 to 1980, CTV), Rocky Mountain Inn (mid-80's, syndicated) and Ronnie 'n the Browns (1990 to 1991, syndicated). Prophet was named Country Male Vocalist of the Year at the Juno Awards in 1978 and 1979, Entertainer of the Year and Music Duo of the Year with Gloria-Anne Carriere at the 1984 Canadian Country Music Awards and was inducted into the Canadian Country Music Hall of Fame in 1999.